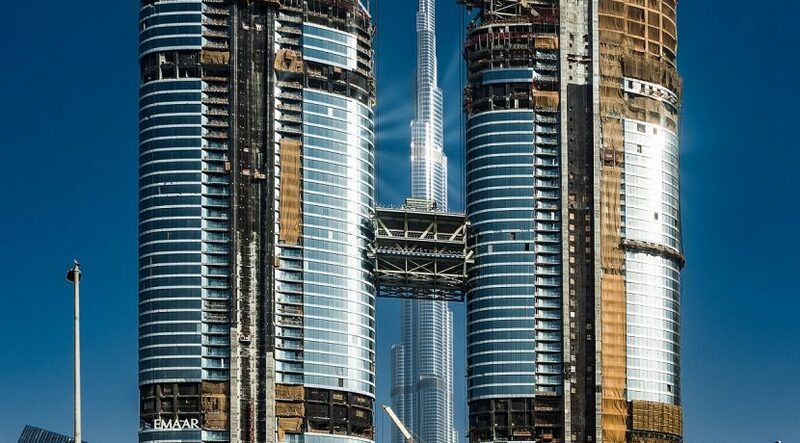 Dubai now has a new architectural landmark: Emaar Properties today accomplished the challenging engineering feat of designing, constructing and lifting an iconic Sky Bridge that links the new Address Sky View hotel with the Address Residences Sky View in Downtown Dubai. Rising at a height of over 220 metres, the 85-metre-long Sky Bridge, with a height of 22 metres and maximum width of 30 metres, has three storeys and will feature eight units of luxurious Sky Collection Duplexes, a 70-metre-long infinity pool that overlooks Burj Khalifa and The Dubai Fountain, and other amenities. Billed to be a new touristic attraction that also adds economic value, the Sky Bridge is fabricated using 4,500 tonnes of structural steel, and was lifted in position using Strand Jacking Technology, customised for the project. A team of global experts from five different entities worked on the project that was completed in around 365 days by over 300 professionals and skilled workers. The unique Sky Bridge addressed several design challenges given the extensive loads of steel and concrete, as well as the loads related to the infinity pool, pool deck and façade, it needed. The ambient temperature difference was also considered during the design stage to ensure that it suits the region’s climate. A steel frame with three levels was designed to hold the huge loads transferred to the core walls of the two towers it links. To address the construction challenges, the main body of the bridge was divided into five elements, each weighing over 400 tonnes each. The fifth element is the MEGA truss in the middle that has a total weight of over 1,500 tonnes. High capacity cranes, not commonly used in the region, were deployed to lift the huge weights. Special high-capacity hydraulic jacks were also imported from Switzerland. 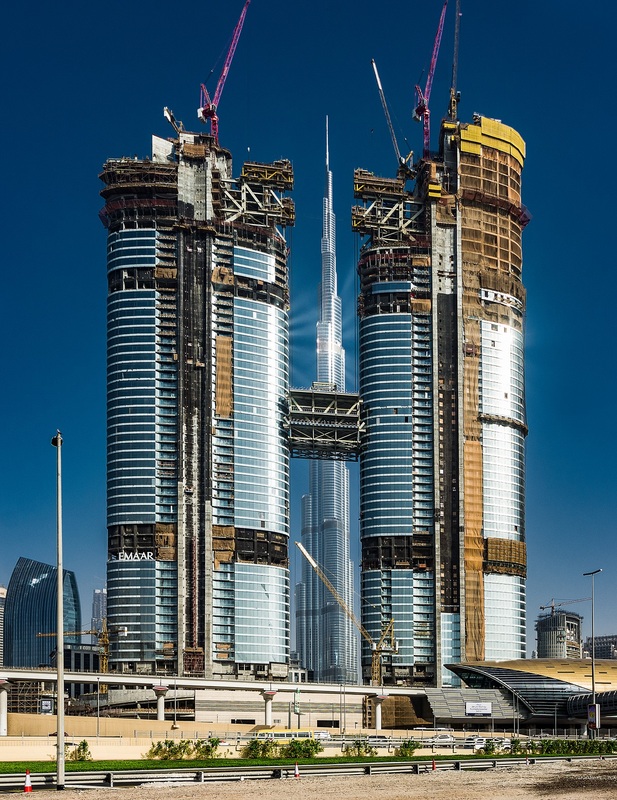 Another challenge was designing eight custom-made Boom and Derrick systems that had to be assembled at level 50 – about 200 meters high – on both towers. Laser technology was deployed for precise leveling. To execute the seamless lifting of the Sky Bridge, each element was assembled on ground. They were then lifted using the Strand Jacking Technology over a period of four months from November 2016 to February 2017. The MEGA truss, the heaviest component, was lifted to the height of 220 metres using the high-capacity hydraulic jacks and cables. The Sky Bridge has undergone extensive fire proofing and other safety and security tests. Each component was elaborately tested to ensure the highest standards of quality and durability. The infinity pool was designed taking into consideration the maximum comfort level of residents. Given the proximity to Burj Khalifa Metro Station and the Metro Link, elaborate safety measures were put in place, and a clearly structured logistics plan was followed through close cooperation with the government authorities. The super-lifting of the Sky Bridge also required tremendous planning, team work and technological perfection, especially given wind speeds of up to 80 km/hour. Each element had to be precisely lifted and erected while addressing all the required safety considerations. A hotel, residential and serviced apartment complex linked directly to The Dubai Mall Metro station through a travellator, the 60-floor Address Sky View towers are 260 meters high, and offers spectacular 360 degree views of Downtown Dubai and the city. The launch of homes and serviced residences in the development has gained overwhelming customer response. Designed by Skidmore, Owings and Merrill, the architects of Burj Khalifa, Address Sky View has 169 luxurious hotel rooms on 12 levels with amenities including restaurants, lounges, a world-class event venue, meeting rooms, three pools including a rooftop pool and a spa. Address Residences Sky View has 551 exceptional serviced residences that are fully furnished with floor-to-ceiling windows, offering stunning views.